Hot chicken wing and wasabi flavored Oreos were released this week in China. 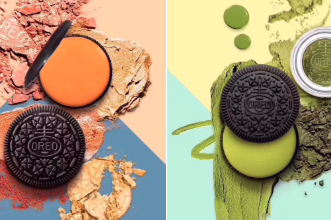 The hottest thing to hit the Internet this week was the new Oreo flavor announcement, and I, being an expert on all things snack and Internet sensations, have taken it upon myself to analyze this development. Wasabi and hot chicken wing are the newest cream flavors to be added to the cookie's cream repertoire, but they're only hitting shelves in China. They join the likes of apple pie, red velvet, chocolate chip, s'mores, peanut butter cup, filled cupcake, cherry cola, brownie batter, pumpkin spice — all seemingly OK additions to a chocolate cookie sandwich snack to the American public. But for some, wasabi and chicken wings are pushing the envelope too far? Honestly, understandable. Opposers, I hear you. It is off-putting to think about eating a chocolate cookie and then getting smacked in the face with the bright-green cream that feels like all of your nose hairs are burning off (if they're doing wasabi right). A suggestion: Maybe the golden cookie would have been a better pick for the shell instead of chocolate? Another point of contention are the colors. I never want to eat anything that eerie shade of green. (Only exception is if it's matcha flavored.) And most especially not in my beloved childhood Oreos, which normally parachute me into memories of school days ridden with suburban Pennsylvania woes and too-many PB&Js on Wonder bread. The orange color, for many Americans, is just bad timing. We're thinking about Halloween these days, so do not trick us with a chicken cookie instead of our beloved, one and true love for one month out of the year – pumpkin. All we do is eat pumpkin in October. That's it. Many of you may want to add these new flavors to a list near and dear to my heart. I call it the "Don't Do That" list (patent pending). Here are a few examples from my list of things that should never be done. Mac-n-cheese stuffed into dinner rolls. On the other hand, I am wont to go against the grain in my snack choices. Sometimes I dip french fries in maple syrup. Crazy? Maybe. I'm not putting these on the list just yet. When I was in China, I ate many chips flavored with chicken, wasabi, fish, blueberry, even lemon tea. Flavors are not all created equal everywhere you go in the world. But flavored chips, like my colleague Adam Herman's latest taste test of Utz's new Italian Hoagie chip, are one thing. Cookies may be something entirely different. Oreo has released a HOT CHICKEN WING flavor and a WASABI flavored Oreo in CHINA!!! Oreo-maker Mondelez International must have known that it would cause quite a stir with the flavors, so honestly, it might have been a mistake not to put them on shelves here in the U.S., if not even for a short period of time. Remember when the fake photo of the cheeseburger Oreo "made with ground beef" made the rounds in 2015? Explosive. People want to try the chicken wings and wasabi so they can have a good reason to complain. Give me the people what they want, Oreo.